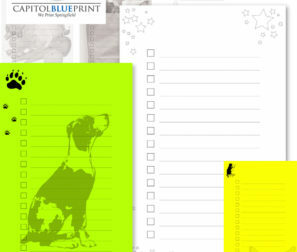 Notepads/Scratch pads make the perfect marketing handout for your business. They are an inexpensive way to build your name recognition and give your customers something that they will use. Notepads have a long shelf life and will not only be seen by your customer but also by the people your customer hands a note to. We also can take your favorite picture and create a customized desktop notepad for the hard-to-buy for person. If you're a serious musician you need a notepad.